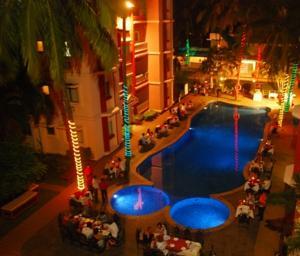 Just 1300 ft from Calangute Beach, Adamo features a gym and pool with jacuzzi. A sauna and steam room is available. The hotel also features a beauty and massage parlor. Adamo The Bellus is a 10-minute walk from Calangute Town Centre, while Panjim City is a 20-minute drive away. Goa International Airport is 28 miles from the hotel. Air-conditioned rooms at Adamo Bellus also come with a ceiling fan. Select rooms provide balconies that overlook the grounds or pool, while also providing tea/coffee makers and minibars. The hotel offers a children’s playground for little ones. An airport shuttle service is available upon request. The hotel also has a business center and tour desk to assist guests with their requests and needs. A variety of Chinese, European and local Indian cuisine can be enjoyed in Hi Palms Restaurant. Light refreshments are served at the pool bar. Free! All children under 6 years stay free of charge when using existing beds. Free! One child under 2 years stays free of charge in a baby beds. One child from 6 to 12 years is charged 20 % of the room stay per night in an extra bed. One older child or adult is charged 40 % of the room stay per night in an extra bed. Maximum capacity of extra beds/baby beds in a room is 1. Any type of extra bed or crib is upon request and needs to be confirmed by the hotel. Supplements will not be calculated automatically in the total costs and have to be paid separately in the hotel.